Review posted May 30, 2011. What an exuberant book! And a beautiful and joyous way to easily learn some Spanish words. Fun to read out loud, too. The Cazuela That the Farm Maiden Stirred riffs off the idea of "The House That Jack Built" with a cumulative story of making rice pudding, arroz con leche. This one, however, adds the innovative idea of introducing the items and animals in English, but then once you know what they are, using the Spanish words in later recitations. that went into the CAZUELA that the farm maiden stirred. As you can hear, the Spanish words inserted are fun to say, and the chant takes on a musical feel. This book makes you want to read it aloud, and I found myself doing that even as I just read the book to myself to review it. How much more fun it would be to read to a roomful of children or a child on my lap. 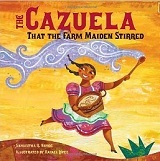 and the CAMPESINO and the farm maiden danced . . .
. . . and no one watched the CAZUELA that the farm maiden stirred. Don't worry! They do get their delicious dish, and the recipe is provided at the back of the book (as well as a glossary and pronunciation guide). What makes this book absolutely perfect and completely irresistible is the pictures. The best words I can use to describe them are exuberant and joyous. The colors are bright. And the people and animals are happy and completely given over to celebration. So this book has it all: Something educational, something traditional, a little bit of plot, great fun for the ear, and delightful to the eye. A winner in every way!